Artist in residence public art. The Peace Garden is a community Garden that is a always adding something new as neighborhood residents tend their garden. Students frome S.T.A.R. Academic Academy made a series of mosaic panels that were then installed onto large raised cement planters as functional art enhancement. The theme was Peace and the students designed and fabricated their own mosaic panels. As the Peace Garden continues to grow, there will be more flowers, art, vegetables added to enhance the experience of visitors who come to enjoy this tiny bit of oasis. 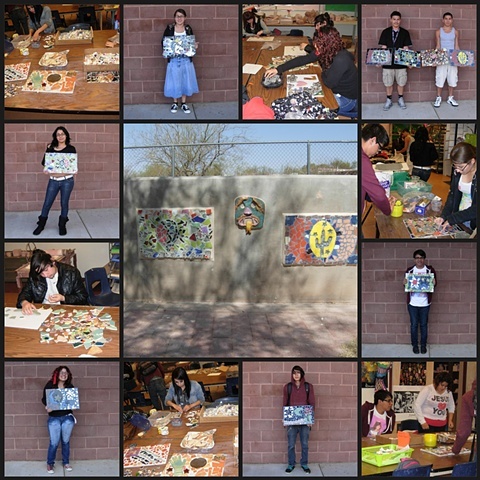 **The STAR Academic Center Mosaic Tile students won first place for their tile project in the Tucson Clean and Beautiful "RUMBA" Art Contest (Reused Materials Becoming Art) with artist in residence Sue Betanzos.